Geothermal heat pumps can be the most comfortable and money saving furnaces you will ever buy, but only if they are correctly sized. An over-sized geothermal will NOT increase your home's comfort over alternative systems. Even worse, an over-sized geothermal (or an undersized earth loop) will run inefficiently, costing you more every month, and wear out sooner than a correctly sized system. This hamstrings a geothermal's benefits. Over-sizing a geothermal heat pump greatly reduces the running efficiency of a unit. A geothermal heat pump takes 10 minutes of running to get to 95% of its efficiency. The longer its cycles run, the longer it runs at the high COP's it is advertised at and capable of. 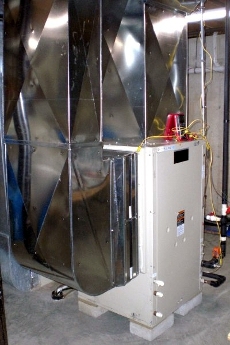 A correctly sized unit that runs longer cycles will save you more money on your heating and cooling bills because high COP's mean you get more heat for your money. Over-sizing a unit and causing it to run shorter cycles will also reduce its life. It's hard to believe, but even just a 10 percent over-sized geothermal heat pump will last about half as long as one that is sized correctly. Unfortunately, we know this is true because we have been asked to consult and troubleshoot on many geothermal heat pump systems that were put in by others. Bottom line is, when a geothermal is oversized and short-cycles itself to death, the only thing that can be done is replace it. Rather than allow this to happen, always have your system matched to the home it is heating and cooling with a correct heat loss/gain and design! Then your geothermal will live up to the potential inherent in these systems of low energy bills, high comfort, and long life. We have sized geothermal heat pump systems for many 2000 to 3000 square foot homes in northern states. The highest one month bill for these homes was between $50.00 and $90.00.